Curious and seeking to discover ever new experiences, the team at Illuminum London explored the highly interactive exhibition Tate Sensorium, currently held at Tate Britain. We were naturally drawn to the show, having our interest sparked and imaginations set to play by the bespoke fragrances, merging of the senses, and perceptions challenged via new technologies. Tate Sensorium is the IK Prize 2015 winning project brought to life by creative studio Flying Object and other collaborators, including our friend and Scent Expert, Odette Toilette. The exhibition is centred around four abstract British paintings taken from the Tate’s twentieth century collection.The show employs an array of innovative devices, stimulating four core human senses of touch, hearing, smell and taste to enhance the perception of each of the selected paintings. We learnt how Richard Hamilton’s Interior II, David Bomberg’s In The Hold, John Latham’s Full Stop and Francis Bacon’s Figure in a Landscape felt, sounded, smelt and even tasted. Sensually engaged in a gallery space, we were able to fully submerse ourselves in the artworks. Affected by sounds, tactile vibrations and evaporated fragrances, the viewer’s imagination is bound to create visual illusions, making paintings come alive. The original scent Pledge, combined with vintage hair-spray and solvent smells, were used to replicate Interior II. With In The Hold alongside jagged sounds, varied concentrations of diesel and tobacco aromas were used to evoke the atmosphere of the ship’s hold. Full Stop appeared to be pulsating as sounds, lighting and touch sensations highlighted the work’s black and white colour palette and voluminous spray paint technique. The grand finale was Figure in a Landscape; the nature of the painting was encapsulated in a single chocolate sweet by master chocolatier Paul A Young. A soil like texture and a leathery smokey flavour of edible charcoal, sea salt, cacao and lapsang souchong tea, closely resembled the rough brush strokes and dark mood of the artwork. Grass, soil, and an animal scent backdrop reflected the painting’s Hyde Park setting. The result of the experience was utterly sensational, a myriad of associations rushing through the head, triggered by distinct flavour and accompanying smells and sounds. 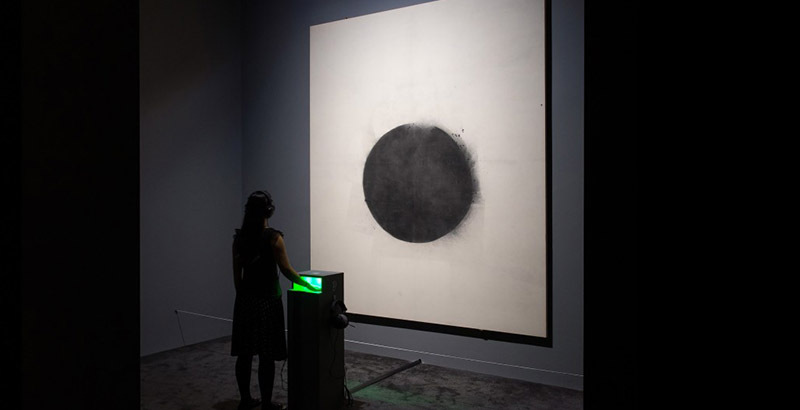 The multi-sensory setting allows the viewer to establish an instant connection with the observed work, potentially adhering its original interpretation. We witnessed an exciting experiment in the evolution of the ways people perceive art.